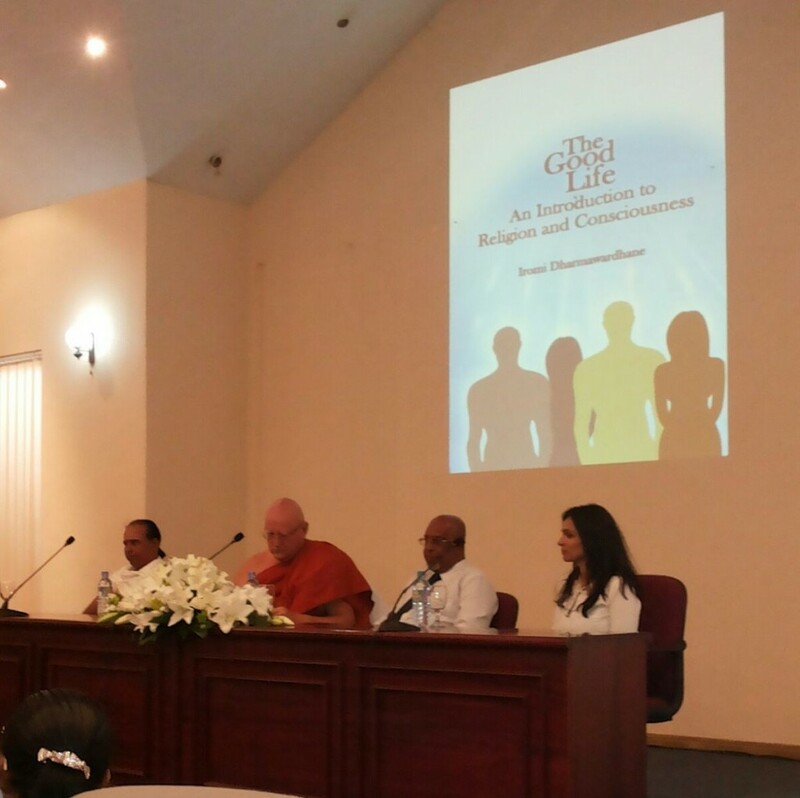 The Good Life An Introduction to Religion and Consciousness by Iromi Dharmawardhane was launched on 9th of January 2016 at the Lakshman Kadirgamar Institute by Stamford Lake Publications. The book launch attracted a full audience comprising members of the academia and NGO sector as well as students and many other interested individuals, young and old. The guest speakers were Venerable Olande Ananda Thero who is well-known in Sri Lanka and worldwide as a veteran in conducting meditation sessions, and Prof. Kalinga Tudor Silva who is Professor Emeritus of Sociology at the University of Peradeniya. Left-to-Right:Ven. Kanagasabapathy Krishnanathan Kurukkal, Hindu Priest of Sivan Temple, Modhara (Special Guest); Ven. Olande Ananda Thero, Resident Meditation Teacher at the Pagoda Meditation Centre (Speaker); Prof. Kalinga Tudor Silva, Professor Emeritus of Sociology at the University of Peradeniya (Speaker); and Ms. Iromi Dharmawardhane (Author) seated at the head table at the launch of The Good Life An Introduction to Religion and Consciousness at the Lakshman Kadirgamar Institute, Colombo on 9th January, 2016. The Ven. Olande Ananda Thero stressed the importance of meditation practice in religion as well as the need for an individual to understand the full depth of one’s own religion, as highlighted in the book by Ms. Iromi Dharmawardhane. Those with limited knowledge and understanding are those who quarrel,” he said. Ven. Ananda Thero also emphasised the positive effects of human consciousness in the form of compassion or loving-kindness” upon the individual and society, as well as the environment at large, citing scientific research studies conducted by Japanese researcher Masaru Emoto and others. He also spoke of how meditation in the form of mindfulness” or observation of the mind in daily living is important for all individuals, not only for monks and clergy persons ̶ the practices of which are explained in the book. Prof. Kalinga Tudor Silva provided a book review, sharing short overviews of each chapter of the book. He stated that while there is wider relevance in light of the religious turn of social and political tension in the world, this book has special relevance to Sri Lanka,” the author being Sri Lankan and the four world religions examined in the work also being the four main religions of Sri Lanka. Prof. Silva believes that this book is essential reading for the students of religion, philosophy and social sciences as well as the general public.” He said that its translation into Sinhala and Tamil is needed forthwith, to make the book more accessible to the readership in Sri Lanka. The event concluded with a book reading by the author, Ms. Iromi Dharmawardhane. She read from chapters which discussed the four religions of Buddhism, Christianity, Hinduism and Islam, providing glimpses of the philosophy and meditation practices of each. She stated that the main aims of her book were to encourage an individual to understand her or his religion in its full, profound depth as well as to engage in the scientific practice of meditation to harness the full potential of one’s mind and consciousness.” She stated that, Science and religion are not conflicting; both disciplines are about gaining understanding through observation and investigation.” She thanked the speakers, reviewers and the publisher for their support as well as her family who provided inspiration to write the book. 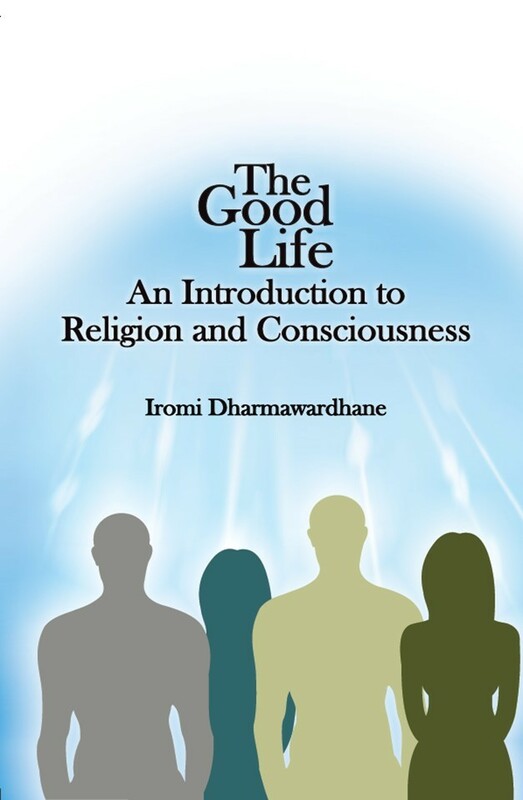 Iromi Dharmawardhane’s elegantly written The Good Life: An Introduction to Religion and Consciousness comprises thirteen chapters (essays). Eight of the chapters focus on the four major religions of the world (and Sri Lanka): Buddhism, Christianity, Hinduism and Islam. Of these eight chapters, four show that meditation practice is central to and similar among these religions and four chapters take on a day of major religious observance to depict the spiritual and philosophical relevance of each. The other chapters are also religious or philosophical in nature and deal with issues of contemporary relevance. In relation to the chapters on religion, the work can be considered a theme-based work of exegesis, where holistic and coherent meanings are arrived at through an understanding of the original religious texts. The book’s key advantages are its focus on meditation which appeals to both ‘religious’ and ‘scientific’ minds, promotion of tolerance between different religious groups by highlighting philosophical commonalities of the major religions, and its comparatively small size and reader-friendly language. The book is available for purchase at the Lake House Bookshop at its Liberty Plaza outlet as well as main bookstore at 100, Sir Chittampalam A. Gardiner Mw., Colombo 2. The book is available for online purchase at www.lakehousebookshop.com, and will soon be available at all leading bookshops and retailers. Seated Left-to-Right: Ven. Kanagasabapathy Krishnanathan Kurukkal, Hindu Priest of Sivan Temple, Modhara (Special Guest); Ven. Olande Ananda Thero, Resident Meditation Teacher at the Pagoda Meditation Centre (Speaker); Prof. Kalinga Tudor Silva, Professor Emeritus of Sociology at the University of Peradeniya (Speaker); and Ms. Iromi Dharmawardhane (Author) seated at the head table at the launch of The Good Life An Introduction to Religion and Consciousness at the Lakshman Kadirgamar Institute, Colombo on 9th January, 2016. Master of Ceremonies, Mr. Miles Brohier is addressing the audience at the start of the launch. The author, Ms. Iromi Dharmawardhane giving a book reading at the launch. Ven. Kanagasabapathy Krishnanathan Kurukkal (Special Guest); Ven. Olande Ananda Thero (Speaker); and Prof. Kalinga Tudor Silva (Speaker) seated at the head table look on. Iromi Dharmawardhane is the author of The Good Life An Introduction to Religion and Consciousness. Iromi Dharmawardhane’s areas of interest and research include religion, philosophy, international relations, South Asian studies, political violence and terrorism, educational psychology and gender studies. She has published journal articles, book chapters and commentaries in these areas. She has a Bachelor of Arts Degree in international Studies and a Master’s Degree in Commerce. She grew up mainly in Sri Lanka and USA, and was born in Prague in the Czech Republic. She has lived for periods in Singapore and Egypt, and shorter periods in Malaysia, Bangladesh and Pakistan.